This is Greg. Greg plays Dragon Ball FighterZ, and he’s pretty damn good. Greg does this using a piano controller. And last night, at DreamHack Austin, he made it into the top 8 on loser’s side with his ivory keys of destruction. I first saw Greg through a Twitch clip simply entitled “Piano Man,” and not knowing why you would relate anything in Dragon Ball to a Billy Joel song, I clicked. What I saw at first was a tense one-on-one between two players. Whittled down to their last character each, the Vegeta player dashes in and reflects away the Goku Black player’s super attack, leaving him wide open for the finishing combo. 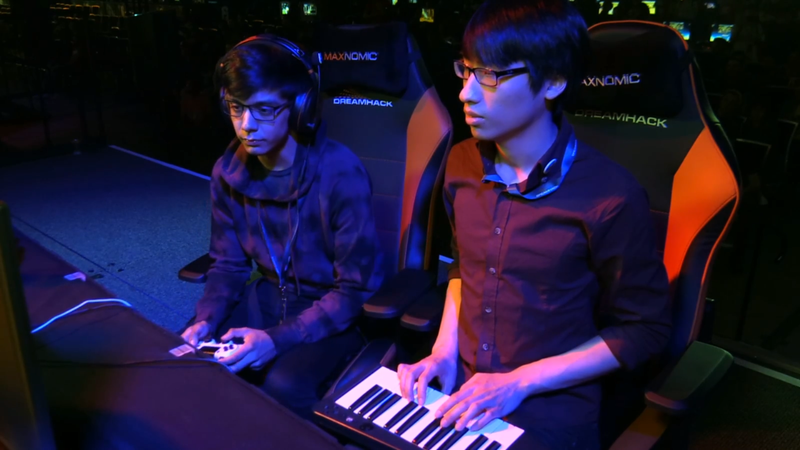 And then the camera cut to the Vegeta player’s hands, resting on top of what appears to be a Rock Band keyboard. It was the perfect twist ending. I couldn’t believe it. This guy is playing Dragon Ball FighterZ, an admittedly more accessible but still anime-as-hell fighting game, using piano keys?! And then I looked at the top of the screen. “Losers top 12.” He’s not only good at the game, and good at playing it on a piano, but he’s making it into the top 8 of a fairly robust tournament. New icon. The camera guys at DreamHack cut to the piano controller frequently to give the spectators at home the picture-in-picture hands view, which also made me realize: Greg is a southpaw! Or at least, he moves his character with his right hand and inputs attacks with the left—the opposite layout you would have with a Dualshock 4 or an out-of-the-box fight stick. Viewers may be surprised but Greg has been doing this for a while; a tweet dating back to February, just eight days after Dragon Ball FighterZ came out, shows Greg playing his tunes, apparently placing as the top seed in his local monthly’s pools. Greg the piano man is currently making top 8 run tonight at DreamHack Austin, where his first top 8 opponent, KH Black, seemed a little surprised. He went on to beat KH Black 2-0 and advance into the top 6. Update [4:02 p.m. ET]: The piano virtuoso fell to Chris G. in the loser’s quarters 2-0 and places 5th/6th overall.